So while waiting for the figures I need to finish off my "Men of the West"-style Dragon Rampant warband, I've started work on a third - "Warriors of the Dark Lord" is the theme, and is going to be a mix of evil humans, orc and goblin-types, and demonic types. I really like Dragon Rampant's tone of "play up the stereotypes - let elves be archers, goblins be sneaky, etc.," and I'm treating this army especially as if it were an evil army out of a high fantasy novel or a D&D campaign. At the same time, over on the Dragon Rampant Facebook group, this quarter's contest is up and running, with the theme of "Reduced Model Unit." In the parlance of the game, this is a unit where there are fewer models than there are "Strength Points" in a unit, each model being treated as having multiple "wounds" and being thereby tougher than the average foot-slogging infantryman. I took this into account while drawing up my "Dark Lord" list and made sure I had a reduced model unit I could assemble and paint for the contest. 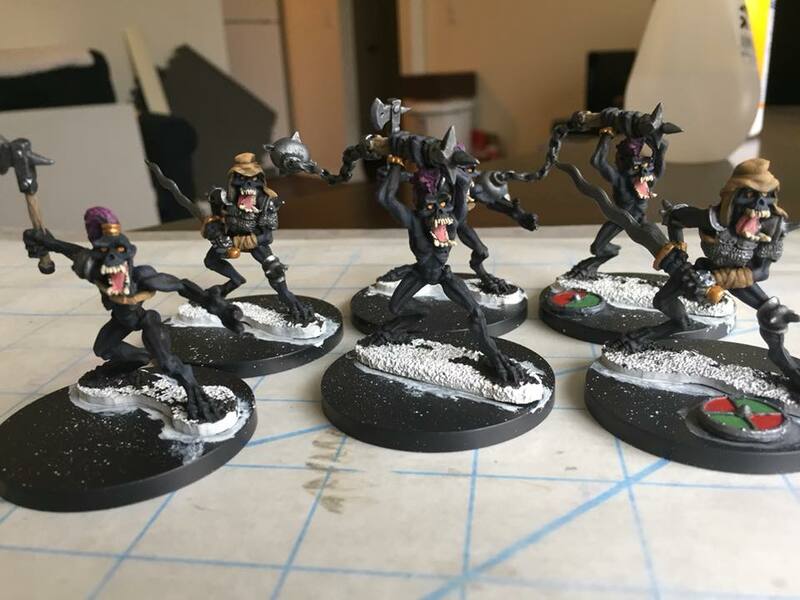 I decided on a reduced model unit of Bellicose Foot, a group of big scary goons with heavy weapons that could rush in and hit hard but lacked staying power. And I recalled that Reaper Miniatures, in their back catalog, had a number of these lanky, skull-faced creeps called "Bakarathi." 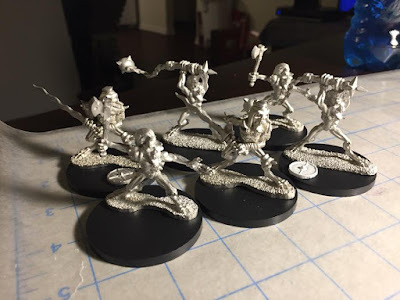 I have no idea what they're supposed to be - they don't correspond to anything I've ever seen in a D&D manual - but I always liked the "skinless baboon" look of them and decided to get myself a few. I bought two each of three different Bakarathi, leaving the archer and spearman sculpts unpurchased. Clean-up was pretty fast, though being older figures (there's a "'98" scratched into the bases of a couple of them, making them almost 20 years old) there was plenty of flash to trim away. Skin is basecoated black, drybrushed "Midnight Blue." Armor and weapons are black then "Tarnished Steel" followed by a wash of Citadel "Nuln Oil." Wood is basecoated "Shield Brown" and drybrushed "Driftwood Brown." Insides of the mouth are "Old West Rose" while the teeth were picked out in "Yellowed Bone" and "Creamy Ivory." Eyes are "Fire Orange," while hair was basecoated "Monarch Purple," given a heavy drybrush of "Royal Purple," then a final drybrush of "Pale Red Violet." Two of them got Foundry shields (dug out of my bits box) glued to their bases to break up the empty space, and these were done in Tarnished Steel, "Pine Green" and "Leaf Green" and "Deep Red" and "Blood Red." Somehow I didn't think that would come out Christmasy. A third (and this isn't pictured here) got a cut-down Bones skeleton glued to their base and painted. Just finishing the basing left to do and I can call these guys finished. Now they look really interesting. They're an interesting bunch, all gangly limbs and ape-like faces. They'll be finished tonight.